How to Reattach a Totem Pole’s Wing? As you can see, one of our totem poles recently lost one of its wings. 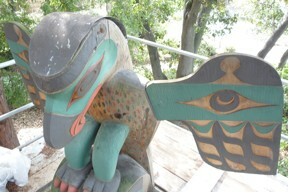 (See my previous post on restoring totem poles). Figuring out how best to reattach it has been an involved process with lots of input from a variety of experts. We consulted with conservators at the Canadian Conservation Institute, had staff attend a conference specifically on the conservation of totem poles and eventually hired a wood conservator to conduct the repair. So what’s the first step? First, the mortise joint needed to be excavated of rotten and deteriorated wood. This was done using a variety of tools including a pick, a vacuum and our fingers. 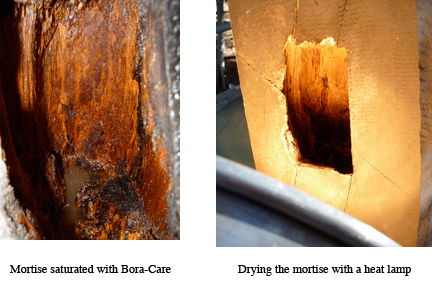 Second, the mortise was saturated with Bora-Care – a borate-based wood preservative – in order to ensure any fungi or pests that may have contributed to the deterioration were killed. 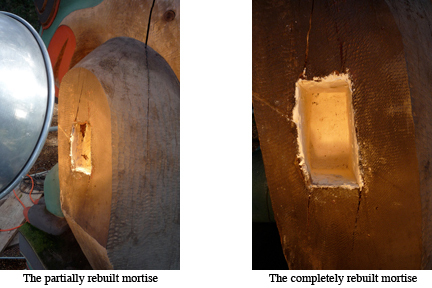 Next, the remaining wood in the cavity was solidified using a proprietary wood-hardening product called WoodEpox. This hardener was then cured with a heat lamp. 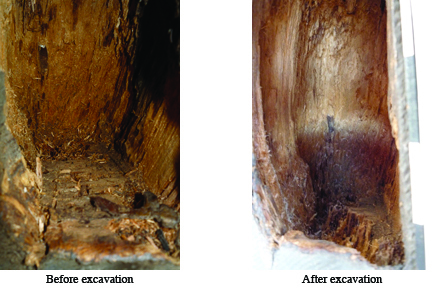 Once the hardener was fully cured, the mortise joint was rebuilt using a pre-bulked epoxy also made by WoodEpox. The hardener and the filler are designed to work together in order to produce the strongest bond between the wood and the epoxy. The pre-bulked epoxy had the consistency of fine, wet sand and because of this it was easy to manipulate and pack into the joint. Of course, the wing still had to be treated. 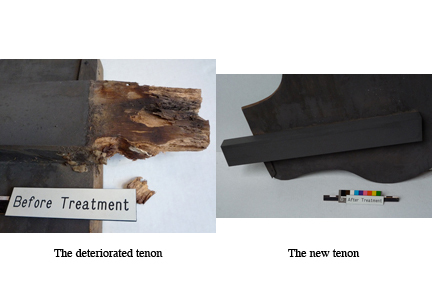 The tenon was also badly deteriorated and a new piece of Western Red Cedar had to be spliced on. The new brace was also treated with Bora-Care and painted to match the weathered paint of the pole. With the new tenon spliced on and the mortise rebuilt, all that was left was to adjust the fit of the wing and pin it in place. 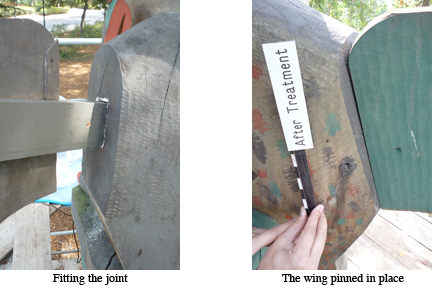 Upon fitting the joint it became clear that the artist had pinned the wing from the front in order to counteract the weight of the wing. Since the mortise has to be a little bigger than the tenon in order to fit the joint smoothly, the fitted wing will pull away from the body of the totem unless it is pinned in place. One of us held the wing flush with the body of the totem while the other drilled the hole for the stainless bolt. After it was pinned, the head of the bolt and the visible epoxy was in-painted to match the weathered paint of the pole. And that’s it! The new wing is now in place and – considering its epoxy support, borate treatment and newly spliced tenon – will probably out last the rest of the pole. Though not expressly stated, the aforementioned experts included members of Coast Salish peoples/First Nations of the Northwest Coast. 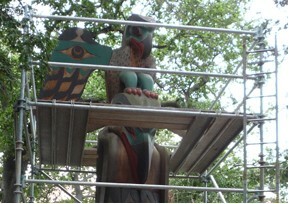 Because the reattachment of the wing would not affect the textual reading of the pole, the decision was made to contract the repair work with a local wood conservator as opposed to bringing in a First Nations carver.